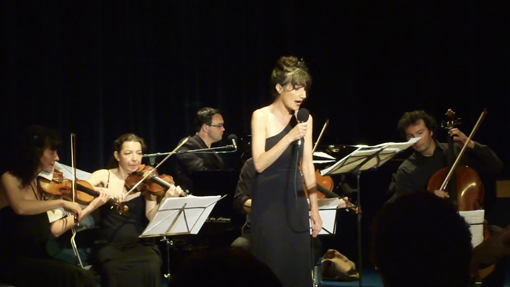 Each year during the second half of July, the ensemble Accroche Note co-produces the festival Plage Musicale en Bangor on the island of Belle-Ille en Mer, giving concerts an also teaching in the summer school. The festival consists of around ten concerts as well as the summer music school where students and teachers play repertoire classics and new music. The musicians programmed are internationally renowned artists who also teach at the summer school. The concerts take place in various magnificent and unusual sites on the island: la Pointe de Poulains (a breath-taking cliff face), in the island’s many rustic churches, in a bookshop, at the port in Sauzman and even at the lighthouse. The summer school takes place at the same time as the festival catering for young and old, amateurs and professionals alike who come to perfect their art. Each year several commissions are made for new works by composers invited to the festival. This annual event is organised long-term objective of participating in the cultural life of the island. The festival aims to provide the highest quality artistic events with a policy of keeping ticket prices low thus making music accessible to the widest possible demographic. Summer school, concerts, premieres… a musical hive at Belle-Ille en Mer in a splendid landscape.